Summary: Ashampoo WinOptimizer is a visually interesting Windows all-in-one utilities suite. It is light and loads fast, easy to operate, and equipped with abundance tools and utilities. But unfortunately in a time when dozens of similar products have flooded the market, this quality only means little. Not to mention the price tag of WinOptimizer makes it a direct competitor for the other products with better value like TuneUp Utilities. What We Like: Light system impact and fast operation, colorful interface, easy navigation, and lots of tools and utilities that you can choose from. All of this comes from one single application. What We don’t Like: Like most other Windows all in one utilities suite, it just feels like a compilation of mini programs in one package with no extra value. We can’t get a “true” automatic Windows optimization leave alone a dynamic system analysis for further system optimization. And talking about the price, Ashampoo surely should get their heads down. In software industry, Ashampoo has been responsible for more than a dozen of software in almost every type of segment, from multimedia to security protection. One of the most famous inside the pack is WinOptimizer. This is an all-in-one Windows utilities suite that can help you out in optimizing, tweaking, and beautifying your Windows with its complete arsenal of tools and utilities. But the main question here is can it challenge TuneUp Utilities and steal the crown of the best Windows optimization software? In system optimization, Ashampoo WinOptimizer solidified fundamental Windows optimization features like registry cleaner, startup tuner, and drive optimization that commonly featured in generic registry cleaners by making a great scanning algorithm engine. WinOptimizer will leave you with no false positive result, making sure that there is no important aspect of your Windows being falsely-altered or removed. In addition to its system optimization module, WinOptimizer also strengthen the module with hard drive defragmenter and Windows setting tweaking tools. Instead of just cleaning your registry, WinOptmizer throws you with other supplemental features. This is important because what makes your computer runs slower overtime is not only related to registry problems. By doing a full disk defragmentation, tweak Windows setting to best suited your system needs, sorting necessary startup entries, and removing unnecessary files inside your disk, you will get a fully optimize system. 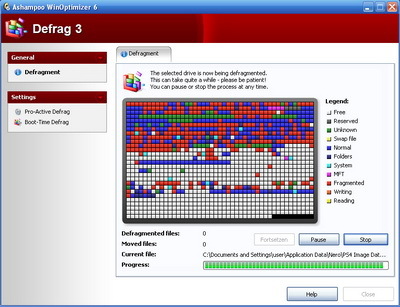 Boot time defrag is another small optimization feature that WinOptimizer has brought. With this module, you are able to defrag system file that normally cannot be accessed. So what WinOptimizer do is defragmenting these system files when Windows is in booting process. In effect, this should make your startup time more efficient. Ashampoo WinOptimizer 7 menu scheme makes you easily find every individual tools available inside. But you might use often its One-Click Optimizer function (right picture) as it is basically a fast access to all of its cleanup, maintenance, and tweaker functions. Moving to other features of Ashampoo WinOptimizer 7, this time we are going to discuss about file recovery and file wiper function. Do you ever have a time when you want back your deleted/formatted file? Or do you ever have accidentally removed your file be it in a removable media like flash disk, flash card (SD card, M2, or the like), and so on? Well, with this function there is a high possibility that you can do that. You can bring to life your lost files from the “dead”. Most of the time, the chance of recovery can be quite high if you don’t do much writing/copying/moving activity with the disk. Anyway, the wiper function is the opposite of the recovery function. Instead of bring to life a deleted file, a wiper make a deleted file stays unrecoverable. The purpose, well you tell me, maybe it is because you don’t want certain videos being watched by someone else, etc. So if you use the file wiper function, even when you use the strongest method of file recovery, it is extremely impossible to bring it back. Regarding file scrutiny, you might also love this one up. WinOptmizer offer file encrypter that protect your important files with strong Blowfish algorithm. This will be helpful in case you want to sent a very important file over the internet but afraid of it being read. Just use the encrypter and your file are password protected instantly. Not only that, combine this method with the file wiper when you want to completely remove any file from this world forever, and you get a very solid condition where no technology can ever recover it. If you need to split one big file over the internet to several manageable parts, don’t worry the package also include file splitter. There is also a small addition of anti-spy protection. Don’t be fooled by its name though, this is not antivirus or firewall features like those offered by System Mechanic and Advanced System Optimizer (ASO). The module only lends you a hand to identify which program automatically sends information over the internet. Another module that offers you full control over your Windows is the contextual menu editor. This module will give you control over the right-click contextual menu: which commands you still want to include in the menu and which one will be excluded. This is important so that your right-clicking activities more efficient. Too many commands in the contextual menu will delay the menu to appear. Finally, the last module that will give you total control over your Windows is the Windows tweaking tools. Inside, there are option of dozens of Windows settings that you will not find anywhere in your Windows, it is normally hidden by default. Not only Windows settings, WinOptimizer also lets you tweak Ms Office, instant messenger, internet browsers, and even email clients. Although not so much as XP, Vista owner could also have minor special tweaks. Weary of your data populate more and more in size rapidly and uncontrolled? WinOptimizer offers you a watchman with its Disk space Explorer module that will help you get a big picture of what fill your hard drive. It will supply you information such as top space-wasting programs and files, dominant and most common file types, and detailed information on file population. All of the information is presented with graphical presentation. With the chart, you can focus your attention to the folders, files, or programs which take a lot of space and decide the next move. But if this module impresses you, we advise you to check TuneUp Utilities Disk Space Explorer, it is more informative and extensive. 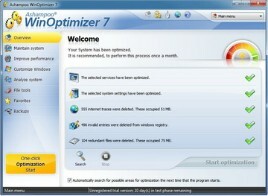 For some of you who are overwhelmed with these optimization and cleaning modules, WinOptimizer offers you One Click Optimizer. This is represented by a button that docks at the upper right of the ‘Modules’ menu. With just one click of this button you can unleash drive cleaner, registry optimizer, and internet cleaner operations. This can help you out if you are still in the smoke of what module should be run to optimize your PC. Basically these three modules are the default setting that will optimize your system. This means you can basically add more modules to run with One Click Optimizer. But if you aren’t sure what you are looking for, just leave it as it is. This is to let you know that WinOptimizer welcomes the advanced users as well as the inexperienced users. 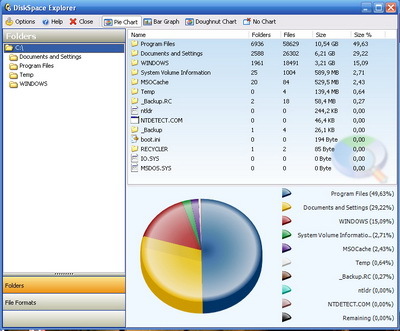 Although not as detailed and polished as TuneUp Disk Explorer, Ashampoo Diskspace Explorer (left) offers a better function than Advanced System Optmizer's. And with its Defrag 3 module (right), you will have more defragmenter options than Windows own tools with Fast Defrag and Intelligent Defrag. Regarding system resource, WinOptimizer is very light on your system. It only needs 128MB of RAM and 40MB of hard drive space. In comparison, TuneUp Utilities and Iolo System Mechanic need twice of that amount. Only Advanced System Optimizer needs smaller RAM size with its 64 Megabytes requirement. It perfectly suits your old system, underperform notebook, and netbook. Tested on our very old notebook running on Intel Celeron 2 GHz, 1GB of RAM, and 160GB of HDD, all can run very well. But it is WinOptimizer who steal the show by its lightning fast loading time, smooth and quick transition between modules, and no-lag operation time. One of the low with WinOptimizer is that it only supports Windows XP and Vista. So if you need system Optimizer for your Windows 98, ME, NT, or 2000, just look for Advanced System Optimizer. All in all, with the tight competition in the Windows all-in-one utilities, Ashampoo WinOptimizer definitely gives a good answer to our dying needs in Windows maintenance and optimization. WinOptimizer answer the challenge by its ease of use and light system impact though still deliver the same great functions. But at $50, Tuneup Utilities gives a more solid function such as its rigorous scanning ability and dynamic system analysis and recommendation. Even if you are into Windows security aspect, at the same price you can get Iolo System Mechanic Pro with additional Antivirus and Firewall protection. Thus we recommend you to pick WinOptimizer if Ashampoo gives a price-cut. Otherwise, better stick with TuneUp Utilities, Iolo System Mechanic, or the less expensive Advanced System Optimizer.